These links are five-ingredient perfection. With ingredients this good, we don’t need to add binders or fillers. We use the same family recipe that we’ve been using since 1889 when Milo Jones started the company. Today, our precooked, Certified Gluten-Free pork sausage products are still all-natural and contain no preservatives, MSG or nitrates. The result is an undeniable flavor you won’t find anywhere else. 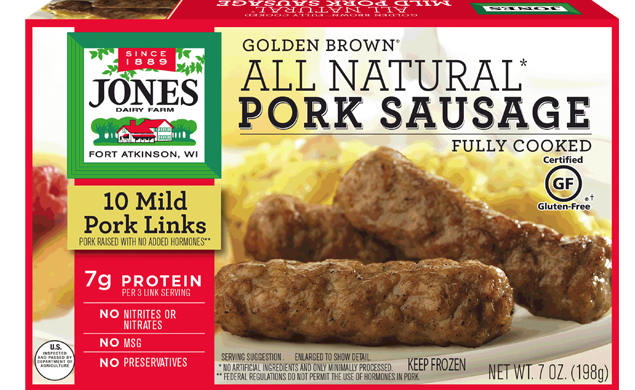 Like all of the products in our Golden Brown® line, these all-natural mild pork sausage ​links are fully cooked and can be found in the freezer section. Heat mild pork sausage links on MEDIUM (50% power), using microwave-safe plate lined with white paper towel, for times shown, or until heated through. Place mild pork sausage links in preheated skillet over medium heat for times shown or until heated through. Turn occasionally for even heating. The 28 oz package contains 13 servings. The 3.5 lb. package contains 27 servings.